CCK&T is a one-of-a-kind boarding and training facility with locations in Fauquier and Orange County, VA. The Chance Foundation is an all-breed, no-kill dog rescue. 4th - Home Visit. We deliver! Please note that most of our dogs get multiple applications. We DO NOT adopt out on a first come first serve basis. We at TCF do our best to match the best family possible with our available dogs. Our dogs are shown by appointment only! Please call/email to schedule a visit today. This gorgeous Soft Coated Wheaton Terrier, Harold, is looking for a very special home! He has been through a lot and we are working with him to help him become a more confident dog. He is good natured but very timid. We are working with him every day to get him more comfortable around people before he is adopted. When we choose a home for him we will require a fenced yard and a local adoption as he is a flight risk. Mia (left) and Mitzi (right), were relinquished to The Chance Foundation as their mommy is dealing with some serious health issues. The family is devastated as they love these dogs very much. We promised them that we would do all that we could to make sure their dogs find wonderful, loving homes. Mia is from Tunisia. She resembles a retriever mix. She is very sweet but also very timid. We are working with her to help build her confidence. Mitzi is a 9 year old Dachshund that lived with Mia. She is an outgoing, friendly, comical, social girl. We will be providing updates as Mia begins to come out of her shell. Their whole world has been turned upside down but we are hoping that eventually we will find a very special person to take them into their hearts and home. Cadence and Chloe are two beautiful retriever mix sisters who are available for adoption. They are approximately 2 years old and are very good natured with dogs and people. We will be learning more about them as the days go by but right now we can tell you that they are big love bugs! Feel free to call us at 540-788-3559 for more information or submit an adoption application which can be found on our website at www.countryclubkennels.com. This beautiful 8 month old lab mix, Zena is a social butterfly. She loves to meet new dogs and people. She charms every creature she meets with her doe eyes and playful disposition. Well... every creature except for maybe cats. Zena is excitable and playful, but also incredibly intelligent and trainable. She aims to please, and is looking for an owner worthy of her loyalty. We are hoping to find Zena a forever home with someone who has time and energy to play and train her. If you are interested in Zena please call us at 540-788-3559 or fill out an application at www.countryclubkennels.com. This little diva is Marguerite. She is an adult Chihuahua/Dachshund, a very fun mixed breed. Marguerite can be shy with new people and dogs, but she warms up to new people quickly. Even though she starts off wary of new people, she wants to be adored by everyone. We are hoping to find Marguerite a loving home where she will be pampered and snuggled to her little heart's content. If interested please call us at 540-788-3559. This magnificent boy is Hero. He is a 1 year old German Shepard mix from a rural West Virginia shelter. Hero is incredibly smart and food motivated. He is doing very well in his training lessons. He loves to give kisses and fetch tennis balls. Hero is great with people, but we are still working on his socialization with other dogs. He does fine walking on a leash with other dogs, but is not sure how he feels about one-on-one play. For now, he would do best as the only dog in the home, and he would bond quickly with his new family. Robin and his sister Annie may look like two of a kind, but, as with most siblings, they could not be more different. Robin lives for an affectionate pat on the head. He will perform any trick he can to vie for his person's attention. Robin and his sister were relinquished to The Chance Foundation when their mom's father fell ill and she felt like she did not have enough time to devote to her precious pups. This was especially hard for Robin, who is always happiest when his person is around to give him lots of attention.Robin was happy for his sister when he watched her get adopted, but he pines for his own home with someone who has lots of time to spend with him. He wants to spend his days following you around as you work in the house or the yard. At the end of a long day, he would want nothing more than to sleep by your side. This cute little senior Maltese is expected to be about 12 years old. We are looking for an adopter or a foster for this special lady. Betty White has kidney disease, which is currently being managed by a special diet. We will happily provide any prospective families with the guidance needed to keep her happy and healthy. Betty White also has occasional dry eye, which requires drops and eye cleaning. She also needs regular grooming. If she is in foster care, you can come out to our facility where we can do this for you. Betty White has become affectionately known as "Bossy Betty". Her tiny little frame holds a huge personality! She is a queen, and she knows it. She loves to cuddle and be affectionate. She will find a way to get your attention, and would be happiest as the only dog in the house, although she is fine with other dogs. Betty was trained to use pee pads. She seems to prefer this over going potty outside. She is a true diva who knows what she wants and how to get it! We love Betty White, but want her to be as happy as she can. She came to us after her dad got very ill and could no longer care for her. She knows how it feels to be loved and we would love for her to be doted on again as the apple of your eye. Meet Wylie, a 5 year old Terrier mix with a complicated past. Wylie is good-natured, but has come to the Chance Foundation for help with his socialization and to learn about love and companionship. Wylie has suffered abuse, but since coming to us he has learned that people can be kind. He enjoys cuddling and playing fetch. He spends many evenings watching television, which his caregivers find very amusing. While Wylie is doing well, he is still weary of strangers and requires time and patience before he can fully trust his loved ones. Wylie responds negatively to strong corrections, and can become possessive over his food and personal space if handled improperly. A patient and experienced dog owner will be needed to give Wylie the forever home that he has always dreamed of. I am a sweet, good-natured gal who is looking for a family who will love me and let me enjoy all the comforts of an inside life. I came to The Chance Foundation from a rural part of West Virginia, where hounds like me usually live outside. It feels good to be done with my hunting life and starting my early retirement in comfort. I'm glad to be here but would love a little family to spend my time with. I love to go on walks, cuddle and play with my dog friends. I get along with humans of all ages. While at the Chance Foundation, I have learned to walk beautifully on a leash, and to sit and wait politely for my food bowl. However, I have not had a chance to live inside for very long and I still need help from a patient, loving family to learn how to behave indoors. Please come out to Country Club Kennels to meet me. I think you will find that I would do great with almost any family, and I don't require much exercise or dog experience. I hope to see you soon! I'll be waiting! Hi there, I'm Bobby. 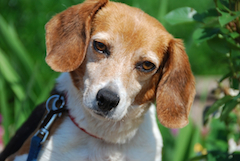 I am a young beagle who recently came to The Chance Foundation. I've been seriously upgraded since I got here; I've put on weight and some of my fur is growing back. I like playing with my new dog friends, and these people here seem alright too! I am learning my basic obedience while I wait for my forever family, and it's going great. I am very treat and toy motivated and will do almost anything for a pupperoni. I am looking for a home that will treat me with kindness and patience, since I haven't had much of that in my life yet. I would be happy to live with other dogs and families of any design. I will enjoy walks around the neighborhood, watching movies with my people, cuddling on a soft comfy bed, and maybe getting a few little bites of whatever you are having for dinner, hint hint! I hope you will consider adding me to your family. I'm a good boy who hasn't had it so good, but I'm ready for a new chapter. I will be an excellent companion to your family, and a lifelong best friend. Please call or email to schedule a visit with me. You won't be disappointed! Meet Saniya! This beautiful young pup is new to The Chance Foundation, and getting to know her has been so much fun. This striking girl is full of life, energy and exuberance! Saniya is young, and learning her basics, but is very smart and eager to please! She loves to play with other dogs, but requires some intervention from time to time as she learns how to play appropriately. Saniya will need a family who will give her plenty of exercise, as well as continue her training so she can be the best girl ever. She would love to go on lots of walks, chase squirrels in the yard, and end her day cuddling with her family. You'll turn heads wherever you take beautiful Saniya. She is striking, sweet, smart and very special. Please contact us for more information on Saniya, or to schedule a time to visit here. Hello, I am Denzel. I am a laid back guy with a heart of gold. I’m a sweet man in the prime of his life. I can play with the best of them, but also appreciate the quiet moments. Spending the first part of my life chained outside has toughened me up on the outside, but don’t let that fool you. I have the gentlest disposition, love other dogs and people, and want nothing more than to have a lap to rest my head on. When I first got to The Chance Foundation, I had just had cherry-eye surgery on both eyes. I hadn’t spent any time around other dogs, and no one had ever been nice to me before. It didn’t take me long to figure out how great it is to have friends and get pets and treats. The icing on the cake: I’m housetrained! All that’s missing now is my forever family. We here at the Chance Foundation just love Denzel. He is a favorite of us all. Denzel has an issue with the ligaments in his wrists which will likely limit his mobility later in life. We will be happy to give you more details from our vet on how you can help keep him happy and comfortable. You should also be aware that our sweet boy has a major obsession with livestock. We believe he would be best NOT living in a more rural environment. Here at our facility, the cows drive him crazy! Hi, I’m Taurus. I have been living here with The Chance Foundation for several years. I have many great friends here who love and adore me, but I am looking for a family who will share their comfortable home with me, and help me continue to grow as I continue my quest to be the BEST BOY EVER! Since I arrived here, I have already learned so much. At first, I was not socialized, and now I am happy to say that I have more dog friends than I can count! I love meeting large dogs, small dogs, males and females, like to play and swim and eat treats, and love going on long walks with my human friends. I am a very sweet boy who will quickly get into belly-rub position and sit at your feet. I haven’t always been so gentlemanly, so I am looking for a family who will help me continue my training and socialization. They will need to be assertive at times so that I don’t get too pushy, but this can be easily learned. Please consider adding me to your family. I will be forever loyal! Taurus has limited vision, which means that consideration must be taken when approaching him so he doesn't startle. We would be happy to give you some tips on how to make this work for you. Hello, I’m Pepé! As you can see, I am absolutely adorable, but before you start squealing, you should know that I am a very complicated man. I’ve been adopted and returned so many times I’ve lost count. I thought I found my special person, the one who could see through my naughty behavior and love me, but here I am at the shelter again. I know that I can be difficult, but put yourself in my paws. It’s heartbreaking to be given up on, so know I’m on the defensive, not giving away my love too quickly. I will put you through the ringer and make you work for it, but if you keep at it, I promise I will show you my sweet side which is buried deep inside. Now for the good stuff – I love belly rubs, walks to the pond so I can dip my feet, playing with stuffed toys, treats and prancing around showing off how lovely my fur is! I am a perfect little size to fit into your home coming in at a whopping 10 pounds. I have been working very hard on my good behavior and making great progress with a few of my friends at work. I am house trained and crate trained and know “sit” and “lay down” flawlessly! Pepé is a long term resident at The Chance Foundation and it will take the absolute right person for us to send him off into the world again. He is not afraid to bite and does not take corrections well. It will take the right person a significant amount of time to make a connection with Pepé. This will be a process that we would ask you to be fully committed to. Pepé would do best in an adult only household. He is ok with other dogs, but does misbehave from time to time. He will require a bit more caution with grooming, visiting the vet and being in public, so please consider carefully and make sure you are up for the challenge. For 12 perfect years Howard was a member of our family. Howard was incredibly protective of his family and found himself in some trouble as a sassy 3 year old. We vowed as a team to keep Howie safe and the only way to do that was to keep him with his CCK&T Family. The day he left us there was not a heart left unbroken among the staff and volunteers of the CCK family. Howard lived like a king in our kennel and his incredible personality and ability to love will never be forgotten. Howie meant so much to our team here, He was the best listener and many of us would use him as a shoulder to cry on. He was also incredibly protective of his family, we never felt unsafe with him around. But best of all Howie had a heart bigger than anyone could imagine. His love had no limits. Our family lost not only our Shining Star, but our therapist, body guard, and our Best friend. See you over the rainbow one day, until then.... We love you Howard. The Chance Foundation© is a recognized Non-Profit 501(3)(c) Foundation.